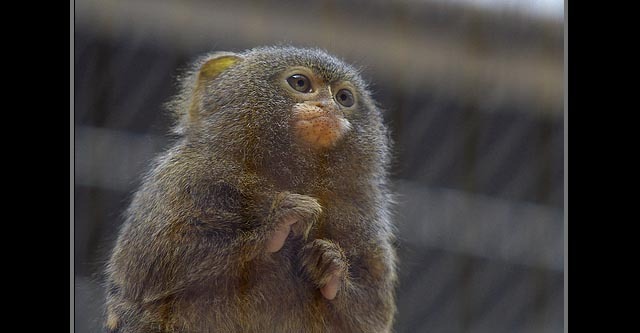 The Pygmy Marmoset, looking like a reincarnated Furby (did you already forget about those? 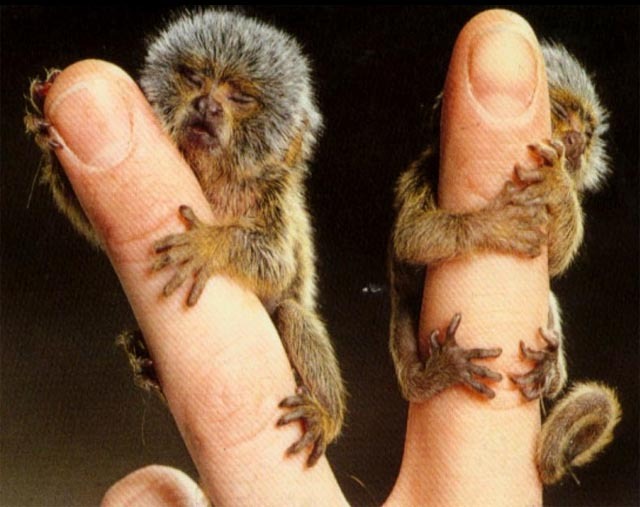 - a must-have toy in 1998), is the world’s smallest monkey. They range in length from 5 to 6 inches not including the tail, which is an amazing 6 to 8 inches in itself. Their name comes from the French word marmouset, meaning “shrimp” or “dwarf”. 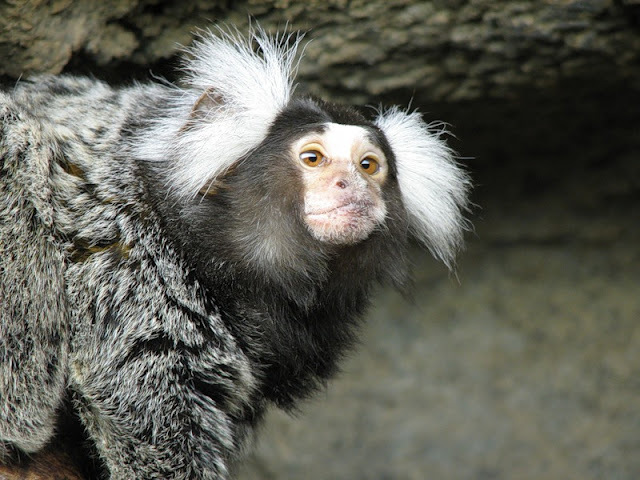 Staying true to their heritage, the Marmoset has the taste pallet of a French food critic, enjoying everything from fruits, leaves, small reptiles, and tree sap. They spend about two-thirds of their life rabidly clawing at bark using their specialized incisors in search of the sweet, sweet sap. They can make up to 1,300 holes in a single tree, and the tricky buggers will even leave some sap behind to attract butterflies which they promptly eat. 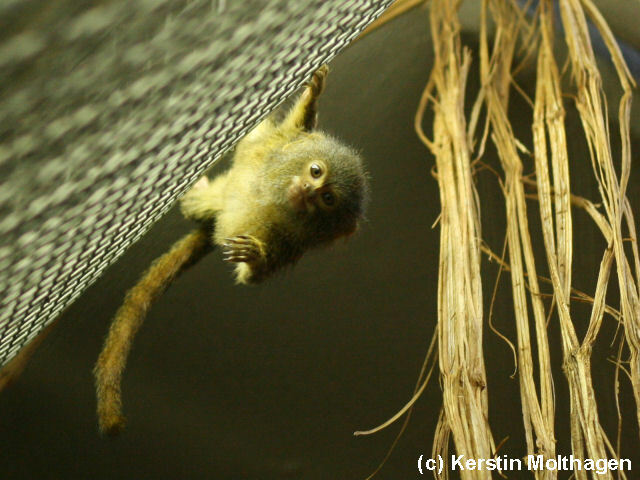 They spend their time literally hanging out in the rainforest canopies of Brazil, Colombia, Ecuador, and Peru. Their small size means they can reach heights other animals can’t, so they get the pick of the food (they only weigh about 4 or 5 ounces, and they use their curly tail to balance on branches in comfort while gorging on dinner). 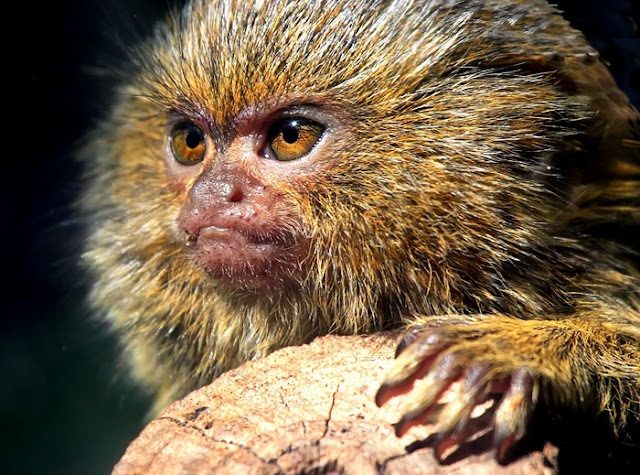 We also might mention that it's the father, not the mother, that carries little marmosets around piggyback style until they’re old enough to get their own food. 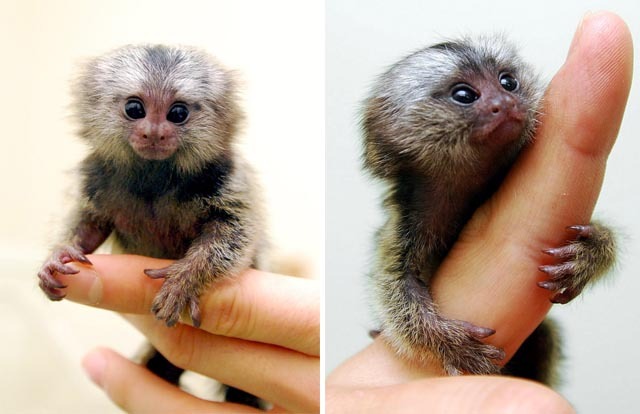 The Pygmy has the same life span as a dog: about 11 years. Good luck finding one in the wild - their fur has magical cloaking abilities and they’re currently being harvested by the US military for making invisibility suits. Ok, maybe I made that up (just checking your attention); you can find them on display in a zoo, for example, in San Diego. 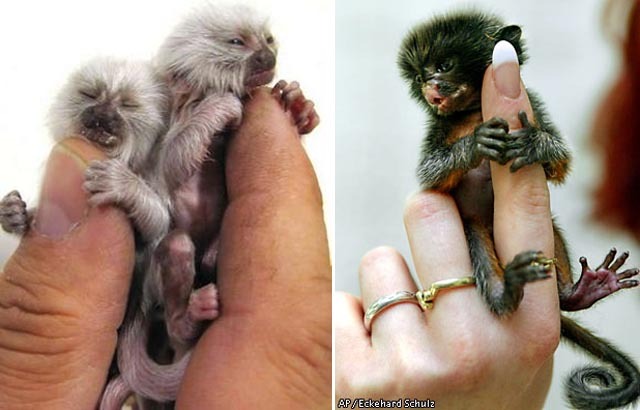 The Bronx Zoo even has twins for the bonus cuteness factor - watch video. 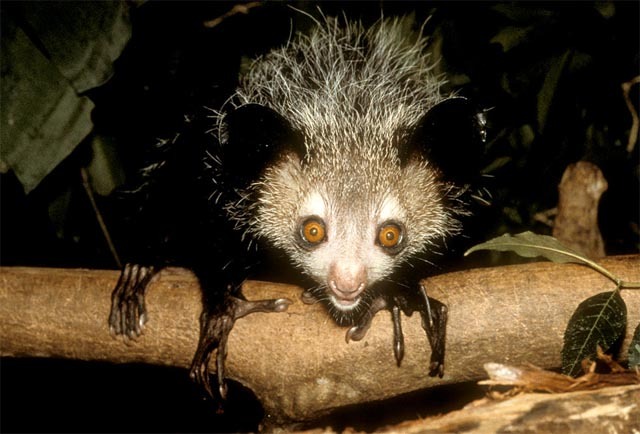 This ruffled-looking stranger is really not that dangerous, pretty harmless indeed - and one of the most endangered... Aye-Aye is a large nocturnal primate from the Strepsirrhini family (the ones that have "wet noses"). 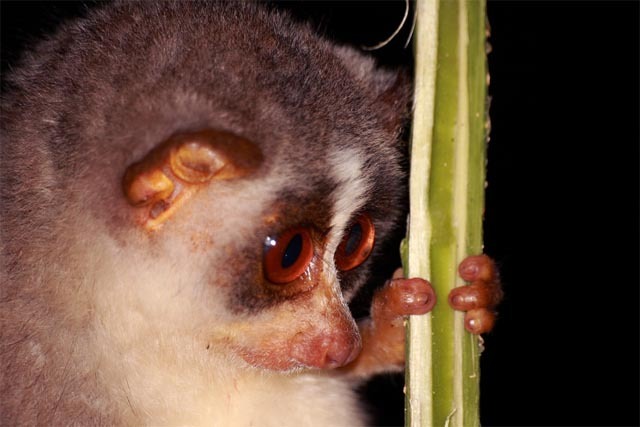 "Aye-ayes can be found only on the island of Madagascar. 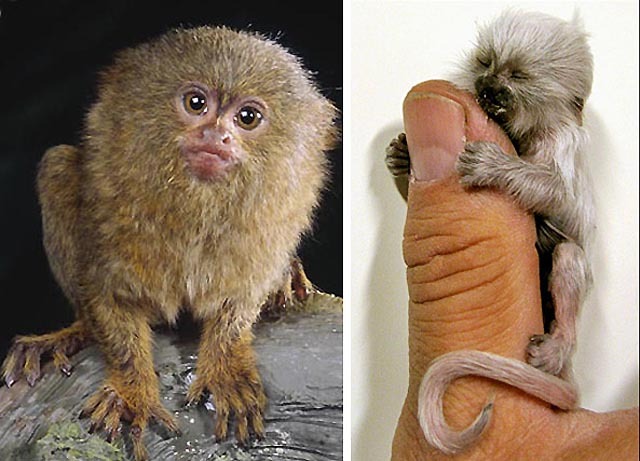 These rare animals may not look like primates at first glance, but they are related to chimpanzees, apes, and humans." 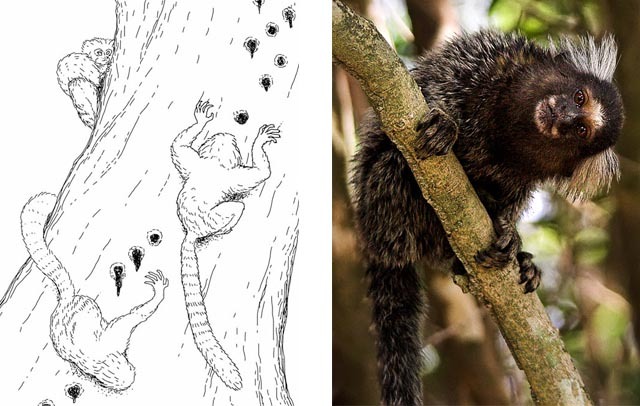 They tap on trees with their long middle fingers and listen for the insects and bugs that might inhabit its depths. Many natives of Madagascar consider this animal an omen of ill luck. 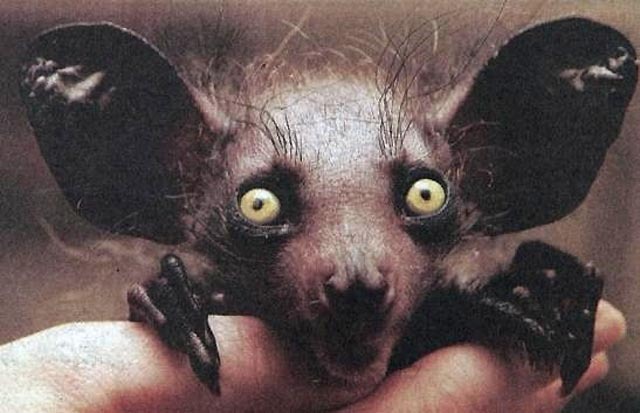 "To the Malagasy people, the Aye-aye is magical, and is believed to bring death to the village it appears in. 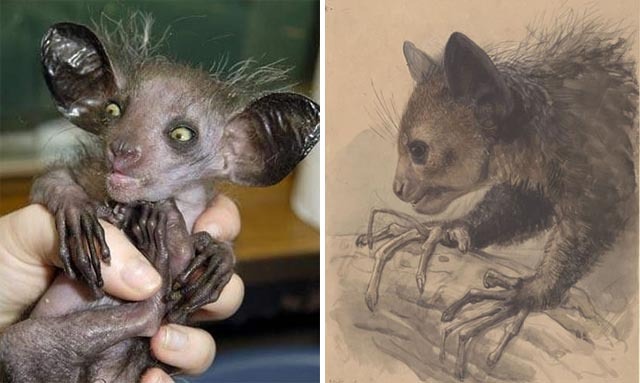 The Sakalava believe that the aye-aye enters houses during the night through thatched roofs and murders the sleeping human occupants. It supposedly uses its elongated finger to cut the aortic vein of its victims". All these beliefs lead to the fact that the poor primates are killed on sight... Looks like it's humans who bring deadly luck to this animal, not the other way around. Sweet! I absolutely am blown away by the animal life on that island! Fantastic! That is just mind blowing, wow. Man I want a few of those ha ha ha. Well are'nt they supah adorable!